AVS Rain Guards - Complete Vehicle, Inc.
By allowing air to naturally circulate through your vehicle’s open windows while keeping inclement weather from creeping in, AVS Ventvisor Window Deflectors effectively reduce mirror fogging, wind noise and a stuffy cockpit.As stylish as they are functional, all AVS vent visors are constructed from high-grade, thick, UV-resistant acrylic material to provide a strong yet flexible fit. Plus, their smoke finish and quality design only enhances your vehicle’s style and complements its overall appearance. 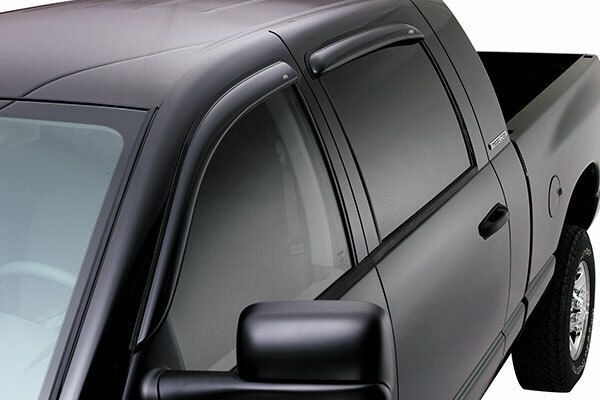 AVS Ventvisor Window Deflectors mount snugly and securely to the outside of your vehicle in minutes using pre-installed 3M adhesive mounting tape applied around and above your windows. AVS External Mount Ventvisors are backed with a Lifetime Warranty.